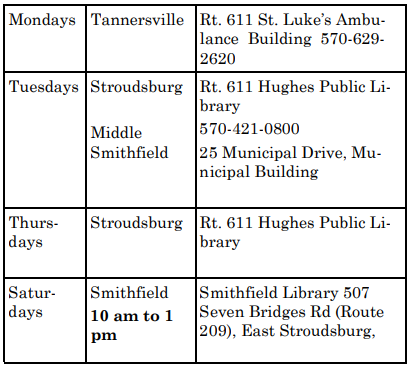 The Schedule for AARP and IRS-VITA/TCE Tax Program for the 2018 tax year is listed below. No appointments necessary at any site. Free tax help for all ages with special attention to SENIORS. Federal, State and Local Taxes as well as Rent and Property Rebates will be completed. This service is being performed through the generosity of VOLUNTEERS from AARP, VITA/TCE and agents of the Pennsylvania Department of Revenue. Identification as well as social security cards for yourself and any dependents. Also bring your 2017 Tax Return and all tax documents necessary for 2018 returns. For inclement weather: If schools are closed, tax sites are closed. One hour delay, sites open regular time.